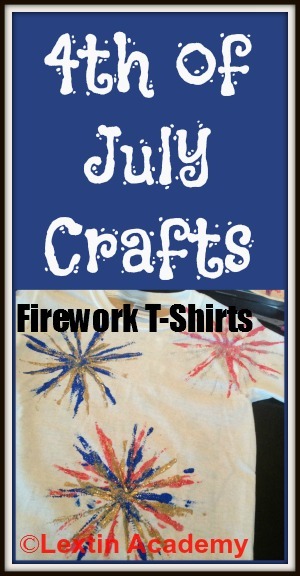 The kids helped me make some fun t-shirts for the 4th of July. They were so excited to wear their creations to watch fireworks! Cut the brown paper bags so that they fit inside each shirt to keep paint from bleeding through. Take 4 pipe cleaners and fold in half and then twist the end to make a handle. Spread out the ends to make a firework shape. Cover one plate in each color of fabric paint. Dip the pipecleaner firework into a color and then stamp onto shirt. Pick up the pipecleaner, turn, and stamp again. Layer on as many colors as you want for each firework! You are so creative Lexi! Don't know how you find time for everything you do!